Posted by mariobc in Trends & Ideas. Nicholas Negroponte has been in the news for a long time as the boss of the legendary “Media Lab” @ MIT. 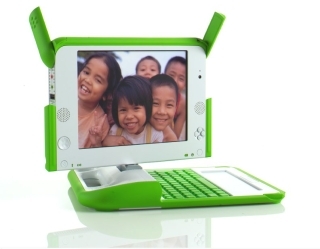 Now in his sixties Negroponte has stepped down from that job and pursues the “1 laptop per child” initiative (OLPC). “Imagine a world where all school-age children own a laptop computer, even those living in villages lacking power and telephone service. With backing from News Corporation and Google, among others, Negroponte has begun to line up millions of orders from Brazil, Thailand, Egypt, China and South Africa. Even the United Nations has bestowed its imprimatur on the concept. Negroponte’s prototype computer is a “skinnied down” version of what he describes as the typical “obese” laptop. Remove sales and marketing costs, and set the machine up with a 7.5″ screen, Linux software, a hand crank for power, rugged rubber case, and super bright display so “it can be taken into the sun and read like a book,” and you’ve got a very inexpensive tool for helping 800 million children explore, interact and create. I guess data storage will be provided by Google (or similar) profiting from ads like with Gmail. Amazing project – certainly one to track and support! Check out the wikipedia entry for interesting additional info, like criticism from industry, 3rd world country leaders etc….